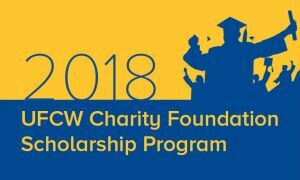 Washington, D.C. – February 13, 2018 – The UFCW Charity Foundation Scholarship application process is now open to eligible applicants across North America. For over 45 years, the UFCW International Union has awarded union scholarships to recognize UFCW members and their dependents in both Canada and the United States. As part of the union scholarship program, the UFCW Charity Foundation awards several scholarships of up to $8,000 each to UFCW members or their unmarried dependents to cover post-secondary tuition fees over a period of four years. The deadline to apply for the scholarship is May 13, 2018. Every year, one scholarship is awarded to a UFCW Canada member. Last year’s Canadian winner was Michael Piaseczny, a proud UFCW Local 175 member and university student who works at Zehr’s Markets in Waterloo, Ontario. The scholarships are available to any UFCW member who has been active since January 1, 2017. The children and/or dependents of active members are also eligible to apply if they are unmarried and under the age of 20 on May 31, 2018. Winners will be selected based on scholastic achievements, community involvement, and an essay that shows an understanding of the principles of the labour movement. Scholarship recipients will receive annual payments of $2,000 for each year that they are enrolled in an accredited college or university for up to four years. To find out more about the UFCW Charity Foundation Scholarship program's eligibility requirements, click here. You can also e-mail any questions you may have about the program to cfscholarship@ufcw.org.